Age 12/13? | 1980/81? 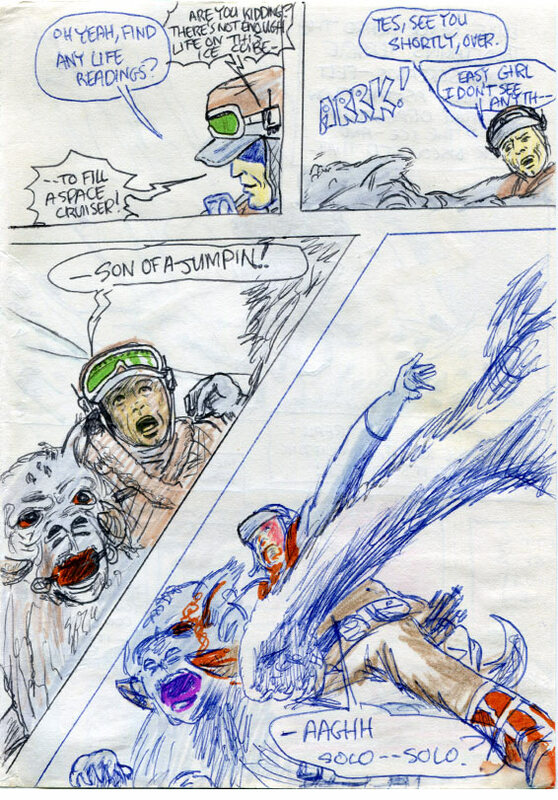 Luke gets walloped by a Wampa! Hence explaining those little changes in poor Mark Hamill’s face that appeared since the previous film. Funnily enough, last night I found a 1980 clipping from one of mum’s magazines. It was inside my old Empire Strikes Back Storybook. The picture—which excited the hell out of me as a kid, seeing some of my first images from the new film—shows Luke walking through that cylindrical corridor on cloud city during his fight with Vader. But guess what’s on the back? Part of a long interview with Mark Hamill, and it’s the part in which he describes his terrible car crash and surgery. There’s something vaguely comical looking about this! I was sure that I remembered him describing in an article how part of his nose was recreated with tissue from his ear. And there it is! He also says how his nose was basically wiped from his face. My God! What a terrible thing to happen to young actor who’s on the brink of worldwide success. 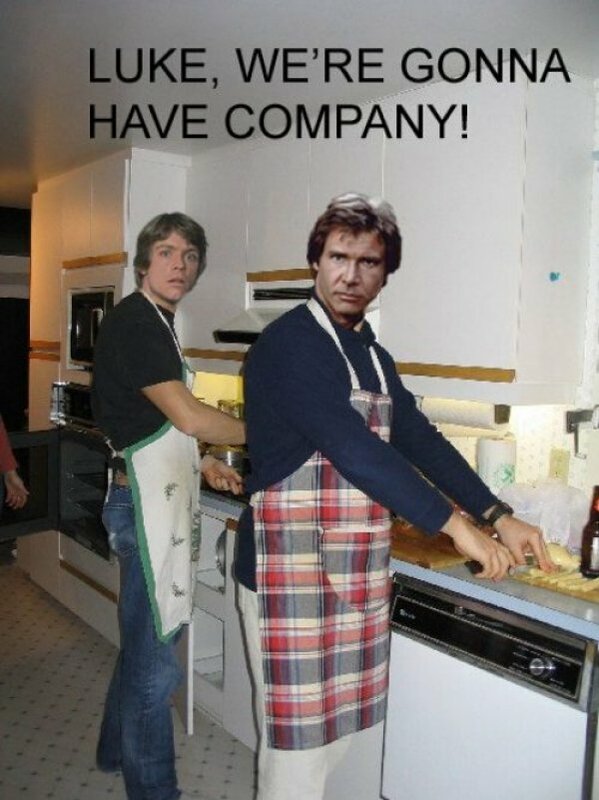 And he was: the accident happened during post-production on ‘Star Wars.’ Before the film was even released. If you’ll recall, if you read my earlier ‘Star Wars’ comic adaptation, most of the images of Luke have retrospectively added scars—at least, what I thought were scars. I think they were actually just natural facial creases. I was going for extra authenticity, even though post-accident scars had absolutely no business in being there! You read more about this here ». And you can see where I added them to pages, here ». Anyway, enough talk of that terribly traumatic period of Mark Hamill’s life. I think he’s subsequently played down the seriousness of the injuries, even though the old article says he had 3 bouts of reconstructive surgery. Just goes to show how he’d prefer to forget about it. I wonder why I used a mix of black and blue biro on this page? Was it an artistic decision, or was my blue biro just running out? “–Son of a jumpin’!” That reads like a very Marvel line, doesn’t it? 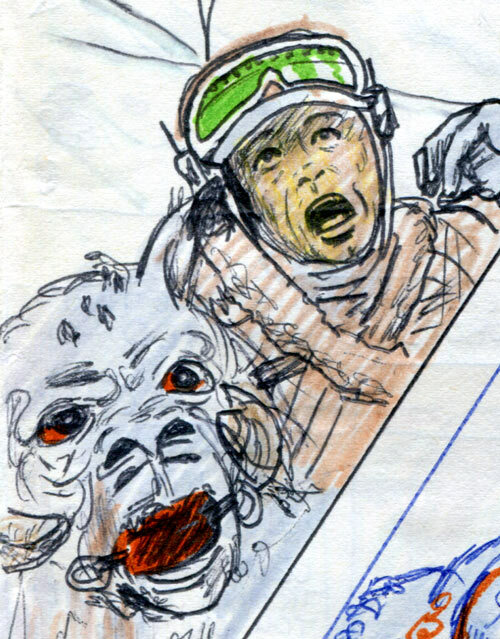 I love the fact that the young you added those scars to Luke, in service of accuracy. I’ve already said it, but the art in these instalments is astonishingly good for a 12-year-old. It sure does! A bit like “Holy Hannah!” which intrigued me in Marvel comics as a kid. I might be flattering myself saying these are possibly the work of a 12 year old. It’s just so hard to know. I was doing pretty astonishing stuff when I was 12 but it’s hard to tell if it was this standard. I must have another look at some school books and jotters/copybooks for comparison. The ones from when I was 12 have Star Wars drawn all over them!